Function: To facilitate, monitor, and report to the general assembly on Missouri-based efforts to contribute to the establishment of national electronic prior authorization standards. Such efforts shall include the Missouri-based electronic prior authorization pilot program and the study and dissemination of information by the committee of the efforts of the National Council on Prescription Drug Programs (NCPDP) to develop national electronic prior authorization standards. The committee shall advise the general assembly and DIFP as to whether there is a need for administrative rules to be promulgated as soon as practically possible. Must submit an annual report to general assembly and Governor regarding progress and plans for the next year. The first report must be completed before January 1, 2013. 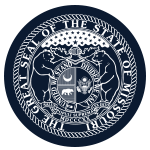 The report to the general assembly on the Missouri-based electronic prior authorization pilot program is due before February 1, 2019. Member Requirements: The Missouri electronic prior authorization committee shall consist of the following members: Two members of the senate, appointed by the president pro tempore of the senate; Two members of the house of representatives, appointed by the speaker of the house of representatives; One member from an organization of licensed physicians in the state; One member who is a physician licensed in Missouri pursuant to chapter 334; One member who is a representative of a Missouri pharmacy benefit management company; One member from an organization representing licensed pharmacists in the state; One member from the business community representing businesses on health insurance issues; One member from an organization representing the leading research-based pharmaceutical and biotechnology companies; One member from an organization representing the largest generic pharmaceutical trade association; One patient advocate; One member from an electronic prescription network that facilitates the secure electronic exchange of clinical information between physicians, pharmacies, payers, and pharmacy benefit managers and other health care providers; One member from a Missouri-based electronic health records company; One member from an organization representing the largest number of hospitals in the state; One member from a health carrier as such term is defined under section 376.1350; One member from an organization representing the largest number of health carriers in the state, as such term is defined under section 376.1350; The director of the department of social services, or the director's designee; The director of the department of insurance, financial institutions and professional registration, who shall be chair of the committee.